Thermostats with adjustable cycle rates are something any home owner can install to lower power cost and help a HVAC system last longer. What is a Adjustable Cycle Rate Differential Thermostat? All thermostats have a set temperature that will turn on and off a heating and cooling system. The temperature difference that a thermostat turns on and off a HVAC unit is called Differential. For example a thermostat with a +-1 degree differential that is set at 70 degrees will turn an air conditioner on at 71 degrees and off at 69 degrees. It is also sometimes referred to as the cycle rate since it is the cycle that a unit such as an air conditioner turns off and on. When HVAC units are turned on and off often it takes a toll on the equipment leading to parts wearing out and needing to be replaced. A unit that cycles often can also lead to larger electric bills. Why is there Higher Electricity Cost? When an air conditioner first turns on is when it has the biggest power consumption. This is mainly due to the compressor which needs a large draw of power to start running. After a compressor has been running for a few minutes its power draw drops. This is the reason that short cycles can run up a power bill. When a HVAC unit first powers on is the hardest time on parts. A units that cycles frequently causes wear and tear on parts which leads to a shorter life span. For example an air conditioner must pump refrigerant through a cooling system which takes more work at the start than it does after it has been running. Using a differential thermostat that has an adjustable cycle rate is a quick and easy way to solve this problem. Your current thermostat may be capable of changing the cycle rate which can be seen in its manual. Many thermostats have a built in differential of +-1 degree, while other will have a +-3 degree differential . With a +-3 degree differential it would turn on at 72 degrees and off at 67 degrees. Most thermostats are rated for +-1 degree differential. Thermostats that have “Adjustable Temperature Differential” or “Adjustable Cycles” in their product description will usually have a +-3 degree differential. The Robertshaw RS5110 thermostat has setpoint differential feature that prevents an HVAC system from short cycling. It can be set from 1 degree too as much as 3 degrees in half-degree steps. It also has a 5-minute minimum compressor off-time which is great when power is interrupted as too not damage the compressor. On a mechanical thermostat, the anticipator setting adjusts the hysteresis. we just had a new carrier performance series furnace 70 thousand btu installed in our townhome . The thermostat that the installer provided is a honeywell T6pro programmable thermostat. The problem is that the furnace cycles on for 5 minutes and off for 15 minutes day and nite. the furnace is rated at about the same as the unit we replaced. 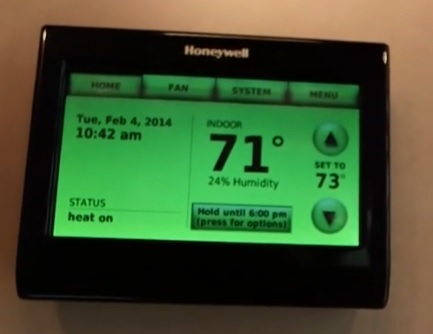 press and hold the menu button on the thermostat down for five seconds or until it takes you to the programming menu. The screen will say “device setup.” Hit select then use the right arrow on the touch screen and press until you see “auto differential.” Press edit, then put the auto differential at “00.” Then click “done” to save your changes and then click back 2 times (I believe) to get out of programming. so, how do we remove or turn-off the 1 degree differential to keep the temp at what i set, not something different from what i set? Does anyone know whether this model supports Adjustable Cycle Rate Differential (+/- 2 Fahrenheit)? Could you please update your list for supported devices? It seems the list is from 2015. Controlling thermal hysteresis is the correct approach. It seems obvious many control systems engineers (Presumably those who design thermostats?) are confused by the most basic of subjects. I leave in Winston Salem NC – often very humid in the summer. My home is often at 52% RH and I use a dehumidifier in the basement to keep it below 50%RH. Will the Fast cycle be better at lowering the RH than the other Cycles? I own a new Sensi WIFI thermostat UP500. The difference is a 1-3 degree offset of the desired temperature. If the differential is set at +/- 1 degree, and the temperature is set at 70 degrees. The thermostat will wait 1 degree over the desired temperature (70) before turning on. Then once the desired temperature is reached(70), it will wait an additional degree(69) before shutting the unit off. This way the unit isn’t constantly turning on and off due to temperature changes in the home. The differential explanation does not make sense. What is a differential of 1 degree if a unit is set at 70 and comes on at 71 but turns off at 69, as that is a difference of 2 degrees? Suppose I had a vat of a water solution that I wanted to maintain 1 degree above freezing. My setting would be 33 degrees for the desired setting. Now, I would like for the cooling unit to come on with a 1 degree differential. It would come on at a 1 degree change at 34 degrees, correct? Now, I ask, why would the unit turn off at 32 degrees which would be making the solution freezing? To me, that is a 2 degree change since the unit came on at 34 and then cycled off at 32. What is confusing me here when we speak of a 1 degree differential? You’re kidding right? Ok, the unit is set at 70, turns on at 71 and goes off at 69. That’s a 1 degree differential from the 70 degree setting. The overwhelming majority of thermostats have this type of differential setting (some have up to 3 degrees).